WOW 48% OFF WHILE THEY LAST. IN STOCK AND READY TO SHIP. Ships to lower 48 states for only $45. A roof rack mounted awning, measuring 2m wide and 2.1m out from the vehicle, which makes it an ideal size for all medium sized vehicles. Quick and easy two person set up, in under 60 seconds. Telescopic aluminium twist lock uprights and rafter poles as well as aluminium rafters that ensure rigidity. Vinyl zip-up cover bag attached to a full length aluminium backing plate which is used to secure onto supplied "L" shaped brackets. 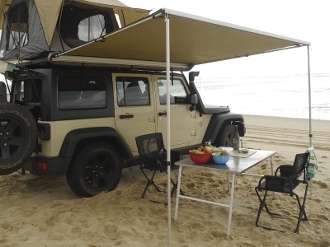 While the "L" brackets can be used to secure the awning to many roof racks styles, the Front Runner Awning Brackets (Product Code: RRAC029) are recommended for use with the Front Runner Slimline II Roof Rack. Guy ropes and pegs included for securing your awning in windy weather conditions. Reinforced corner sections and Velcro tabs to prevent flapping.